Eoce Smart Wi-Fi Light Switch – Control Lighting from Anywhere with Remote Control and Timer, No Hub Required, Neutral Wire Required, Compatible with Alexa, Google Assistant and IFTTT Package List:1* Eoce Smart Light Switch1* Switch Plate1* Quick Installation Guide1* Install AccessoriesEoce provide all customers with the following services.Customer ServiceFor 90 days after the date of purchase, return your undamaged smart light switch and receive a full refund for ANY reason. ServiceFor 2 years after the date of purchase, we take care of all quality-related issues with a REPLACEMENT OR FULL REFUND.Free User Support ServiceNot sure how to get your Eoce product to work properly? Contact Eoce Support Team for quick solutions.Kindly reminder: Make sure to use your light switch as directed to avoid wiring errors and the product does not work. Light switch for voice control — Works with Alexa and Google Assistant(sold separately), control this smart light switch with your voice through select Alexa or Google devices. Operating Temperature: -50 degree Celsius to 80 degree Celsius. Wifi Protocol is ieee 802.11 b/g/n. 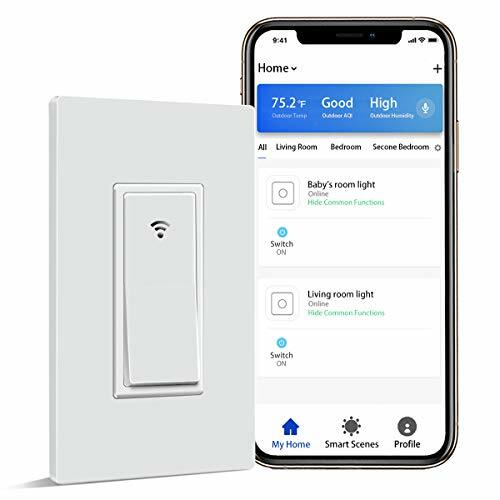 Control your home from ANYWHERE — Turn electronics on or off from anywhere with your smartphone using the “Smart Life” app (Compatible w/ Android & iOS), no hub required, simply replace your existing light switches. Maximum Load: 10A, 800W Incandescent. Smart light switch for scheduling — Schedule your light switch to turn on/off when you want them including sunrise/sunset, easily create fun lighting scenes, or use your voice to ask Alexa or Google to turn off all smart lights. The pre-set schedules makes your schedules always run as expected. Smart switch for sharing — You control, I control, he control. With this smart wifi switch, you can share the device with your families and control the lights together. Never worry that any of them are in a dark room when they go home. Wifi light switch for truly smart — Eoce smart light switch works with all LED, CFL, halogen and incandescent bulbs, and other devices. NOTE: Requires a neutral wire / Require in-wall installaton (Single-Pole Only) with hard-wired connections / Requires a secured 2.4 GHz Wi-Fi network connection.